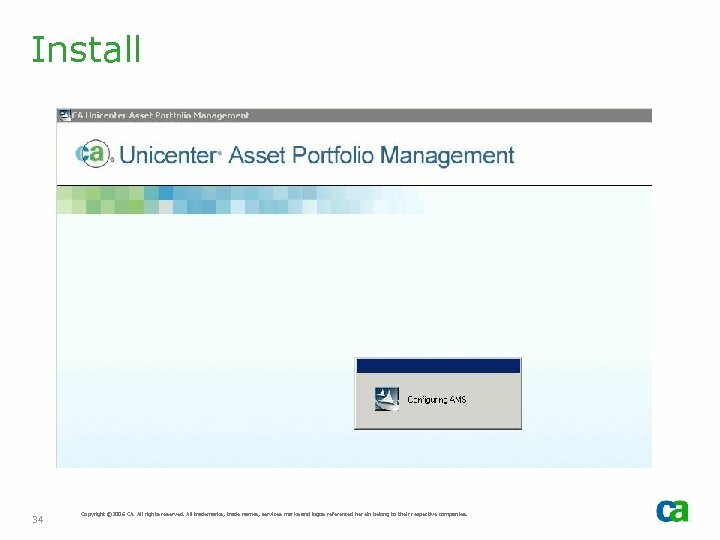 Agenda - This presentation details the installation of Unicenter Asset Portfolio Management (UAPM) in a Microsoft Cluster Server (MSCS) environment. 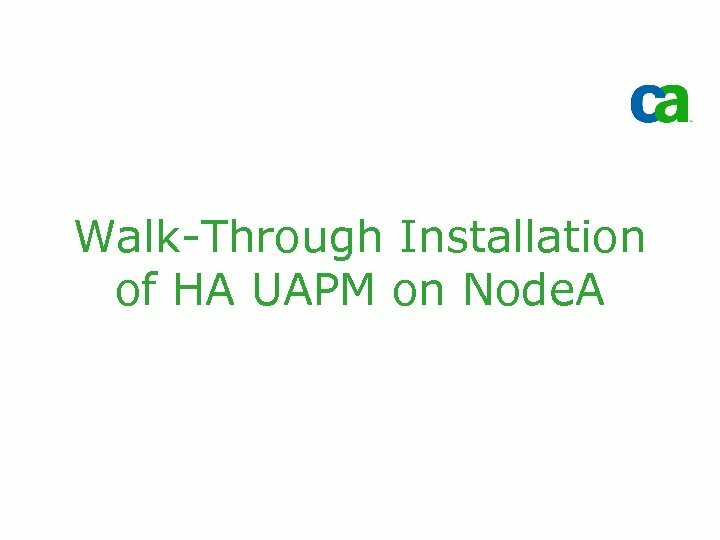 - Installation of the UAPM HA Optional Components is covered in Part 1 of this presentation series. 2 Copyright © 2006 CA. All rights reserved. All trademarks, trade names, services marks and logos referenced herein belong to their respective companies. 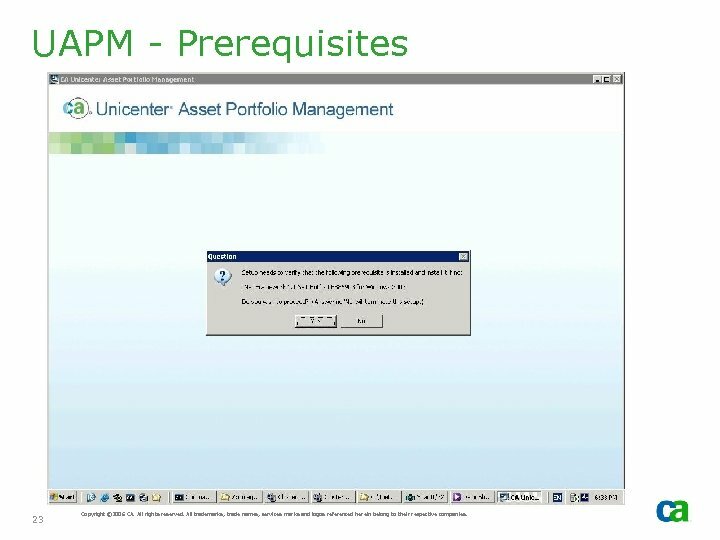 Disclaimer - UAPM does NOT support High Availability (HA) outof-box (but it is targeted for future release). 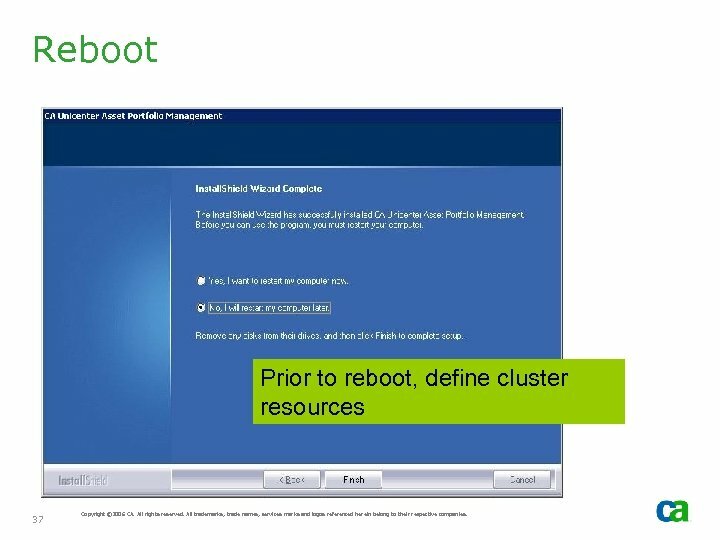 - However, if implemented correctly, these Best Practices demonstrate that it can be cluster aware. 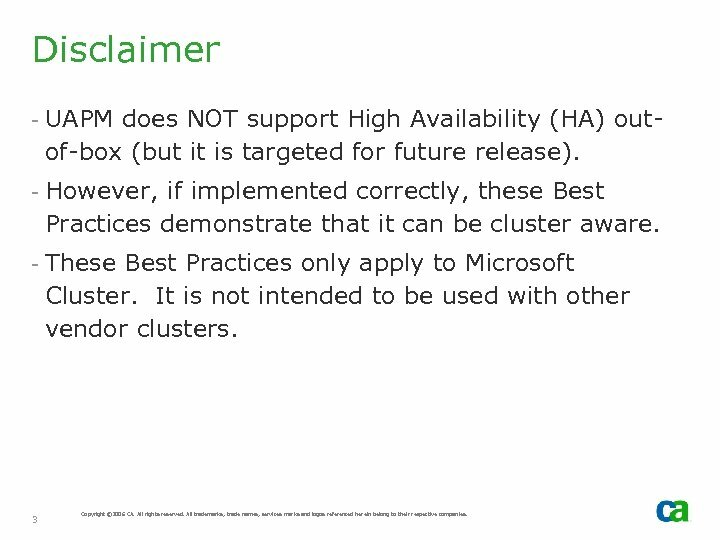 - These Best Practices only apply to Microsoft Cluster. It is not intended to be used with other vendor clusters. 3 Copyright © 2006 CA. All rights reserved. All trademarks, trade names, services marks and logos referenced herein belong to their respective companies. 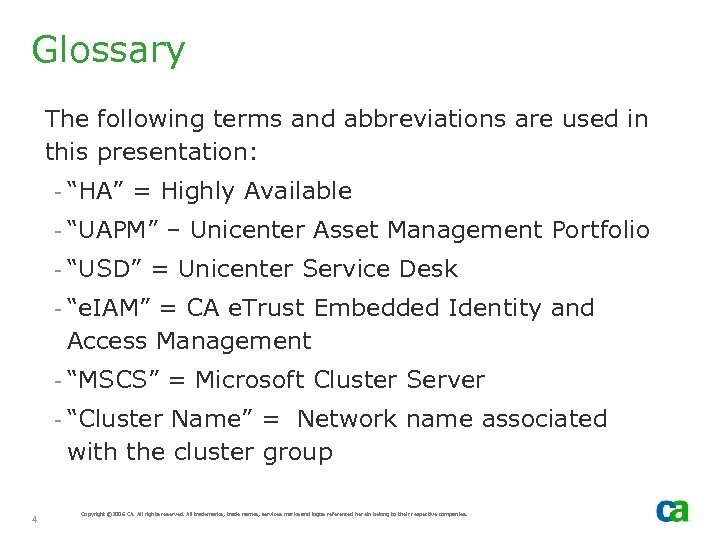 Glossary The following terms and abbreviations are used in this presentation: - “HA” = Highly Available - “UAPM” – Unicenter Asset Management Portfolio - “USD” = Unicenter Service Desk - “e. IAM” = CA e. Trust Embedded Identity and Access Management - “MSCS” = Microsoft Cluster Server - “Cluster Name” = Network name associated with the cluster group 4 Copyright © 2006 CA. All rights reserved. All trademarks, trade names, services marks and logos referenced herein belong to their respective companies. 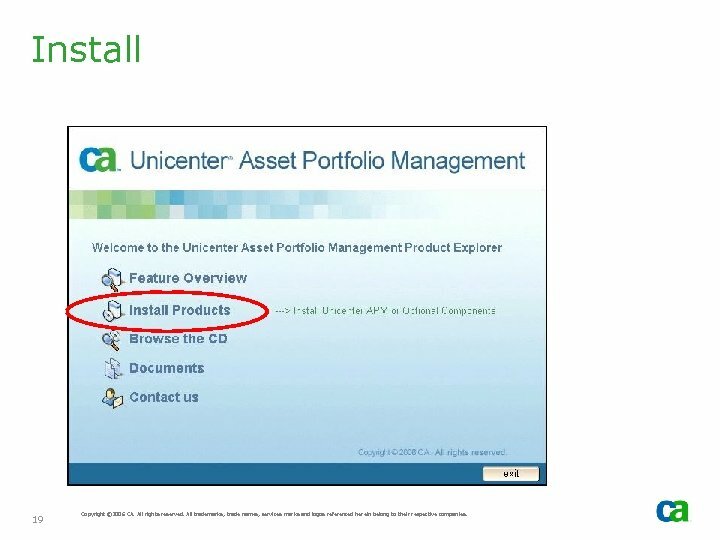 References - The following presentations are referenced and should be consulted for additional information: - Best Practices for Implementing Unicenter Asset Portfolio Management r 11. 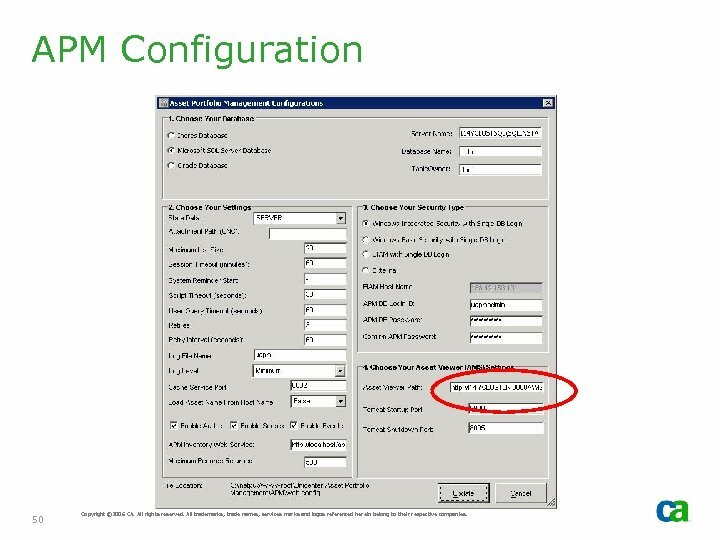 2 in an HA MSCS Environment - Part I – Installing UAPM Optional Components. 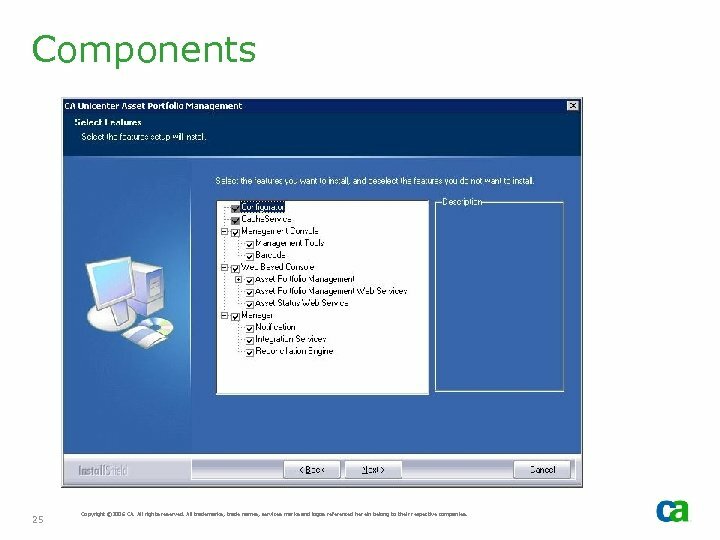 - This describes how to install UAMP Optional Components including creating an HA MDB in a Microsoft Cluster environment - Best Practices for Implementing Unicenter Service Desk r 11. 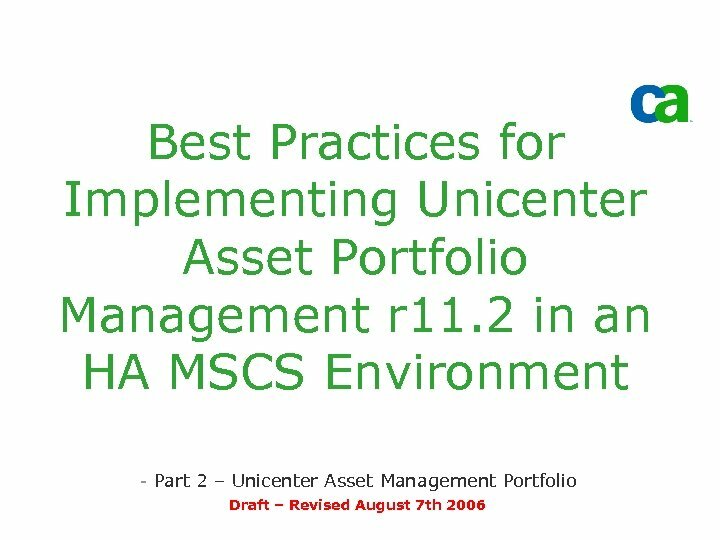 1 in an HA MSCS Environment – Parts 1 through 4 5 Copyright © 2006 CA. All rights reserved. All trademarks, trade names, services marks and logos referenced herein belong to their respective companies. 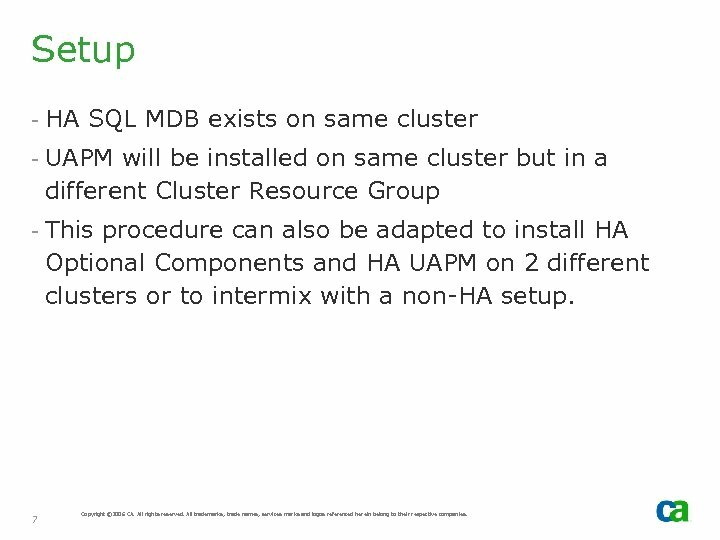 Setup - HA SQL MDB exists on same cluster - UAPM will be installed on same cluster but in a different Cluster Resource Group - This procedure can also be adapted to install HA Optional Components and HA UAPM on 2 different clusters or to intermix with a non-HA setup. 7 Copyright © 2006 CA. All rights reserved. All trademarks, trade names, services marks and logos referenced herein belong to their respective companies. 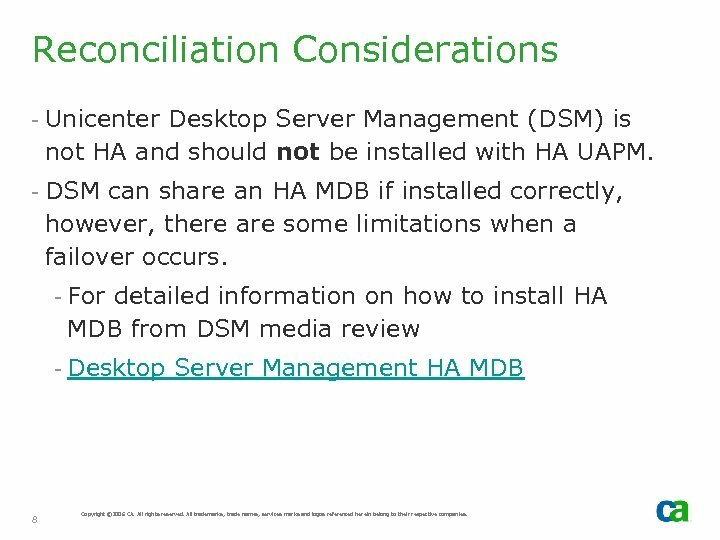 Reconciliation Considerations - Unicenter Desktop Server Management (DSM) is not HA and should not be installed with HA UAPM. 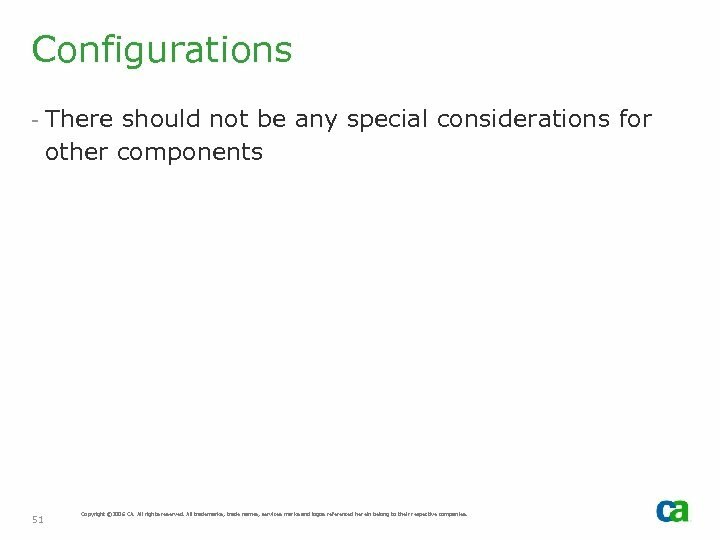 - DSM can share an HA MDB if installed correctly, however, there are some limitations when a failover occurs. 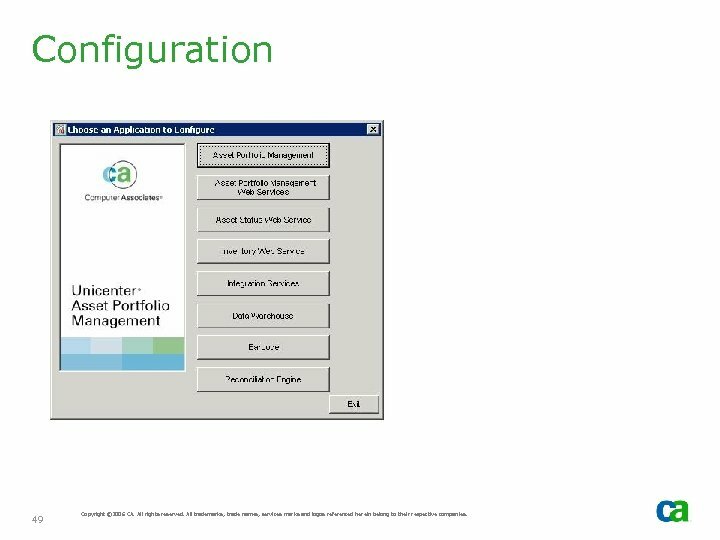 - For detailed information on how to install HA MDB from DSM media review - Desktop Server Management HA MDB 8 Copyright © 2006 CA. All rights reserved. All trademarks, trade names, services marks and logos referenced herein belong to their respective companies. 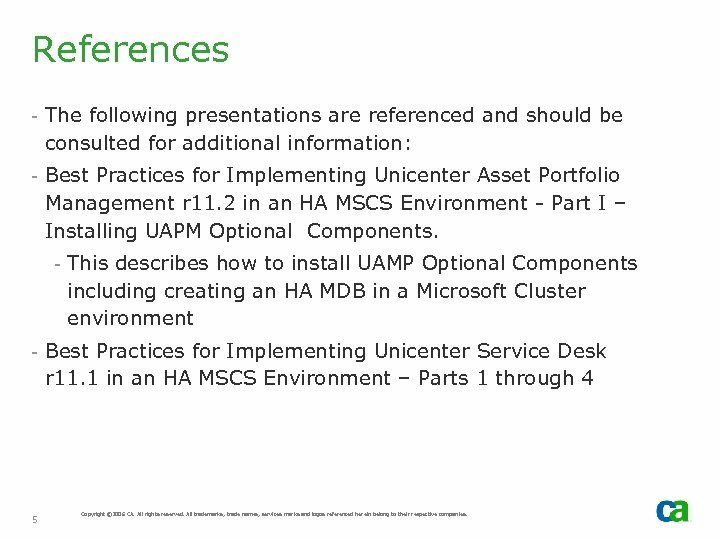 HA - UAPM and MDB UAPM Manager components and MDB on different cluster nodes MSCS Cluster 9 Copyright © 2006 CA. All rights reserved. All trademarks, trade names, services marks and logos referenced herein belong to their respective companies. 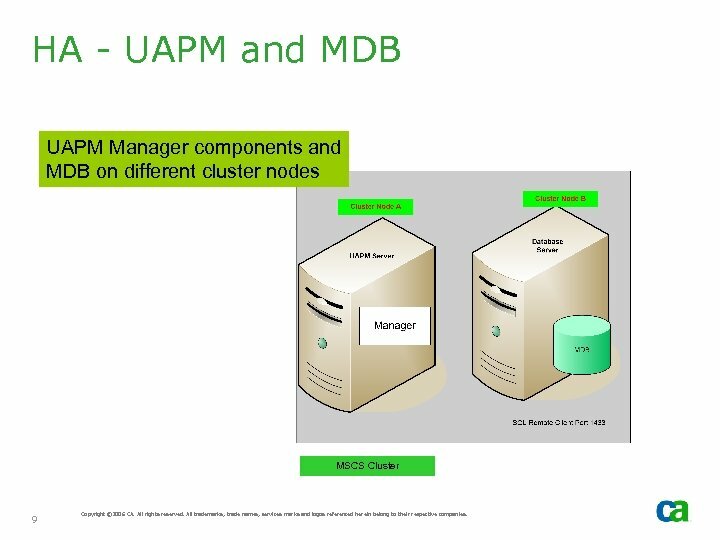 HA - UAPM and MDB UAPM Manager components and MDB on same cluster nodes MSCS Cluster 10 Copyright © 2006 CA. All rights reserved. All trademarks, trade names, services marks and logos referenced herein belong to their respective companies. 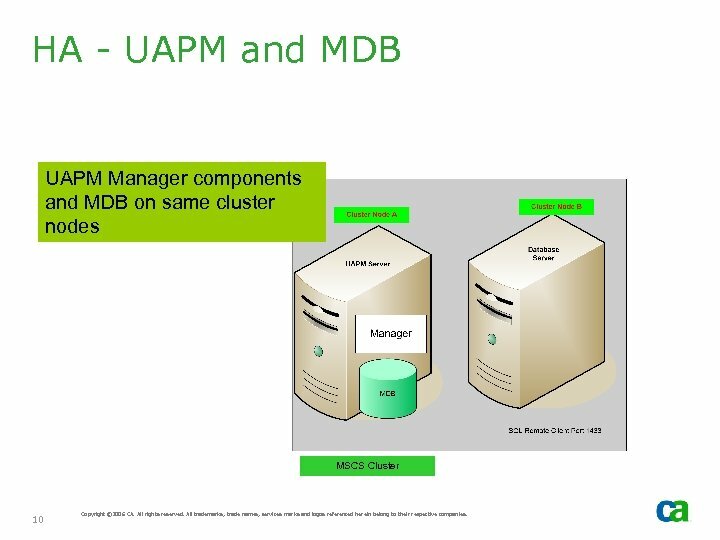 HA - UAPM and MDB UAPM Manager components and MDB on different cluster nodes. MDB is now running on Cluster A. Previously it was running on Cluster B. MSCS Cluster 11 Copyright © 2006 CA. All rights reserved. All trademarks, trade names, services marks and logos referenced herein belong to their respective companies. 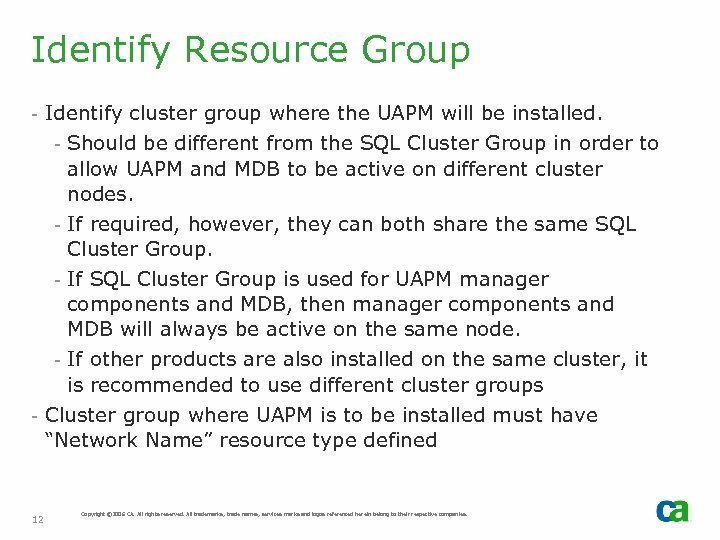 Identify Resource Group - Identify cluster group where the UAPM will be installed. 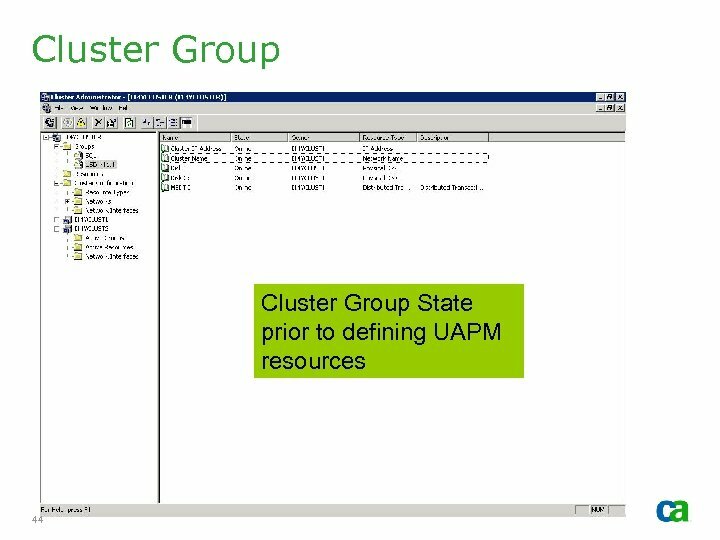 - Should be different from the SQL Cluster Group in order to allow UAPM and MDB to be active on different cluster nodes. - If required, however, they can both share the same SQL Cluster Group. 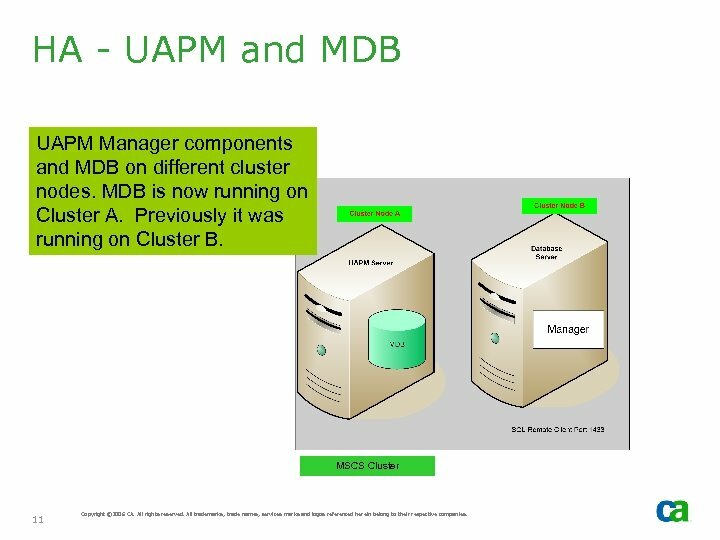 - If SQL Cluster Group is used for UAPM manager components and MDB, then manager components and MDB will always be active on the same node. 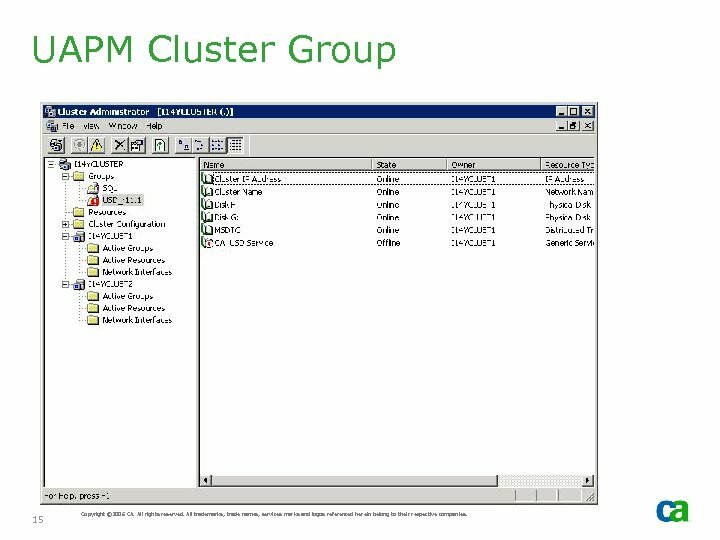 - If other products are also installed on the same cluster, it is recommended to use different cluster groups - Cluster group where UAPM is to be installed must have “Network Name” resource type defined 12 Copyright © 2006 CA. All rights reserved. All trademarks, trade names, services marks and logos referenced herein belong to their respective companies. 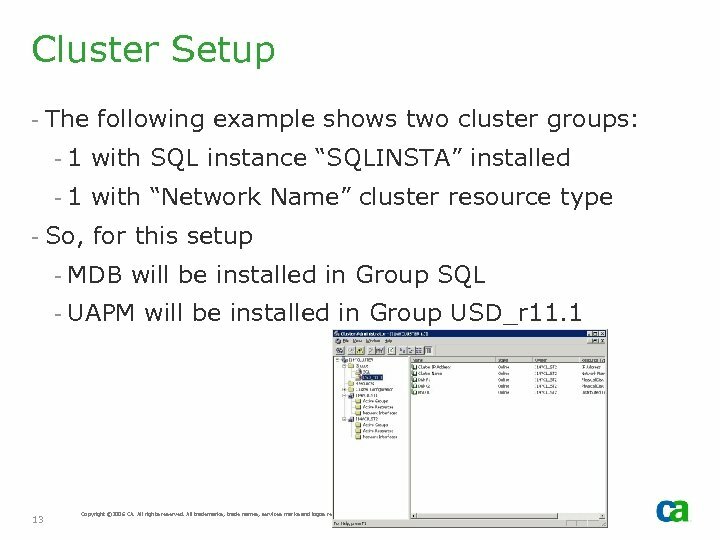 Cluster Setup - The following example shows two cluster groups: - 1 with SQL instance “SQLINSTA” installed - 1 with “Network Name” cluster resource type - So, for this setup - MDB will be installed in Group SQL - UAPM will be installed in Group USD_r 11. 1 13 Copyright © 2006 CA. All rights reserved. All trademarks, trade names, services marks and logos referenced herein belong to their respective companies. MDB Resource Group 14 Copyright © 2006 CA. All rights reserved. All trademarks, trade names, services marks and logos referenced herein belong to their respective companies. UAPM Cluster Group 15 Copyright © 2006 CA. All rights reserved. All trademarks, trade names, services marks and logos referenced herein belong to their respective companies. 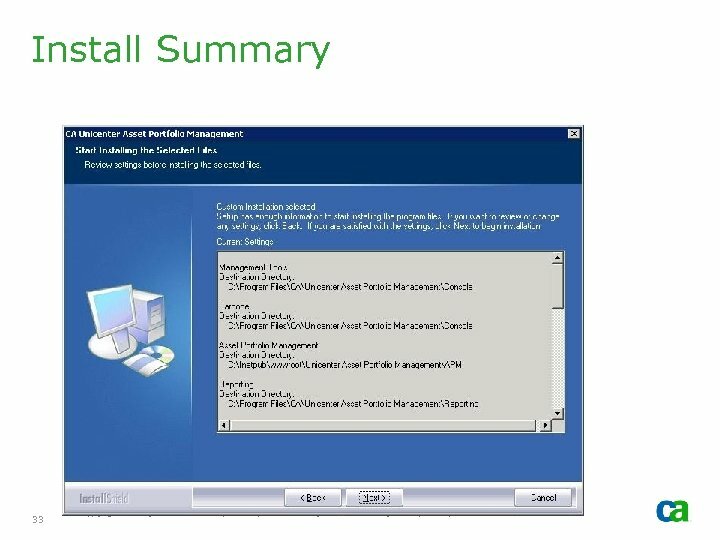 Install Task Summary 1. 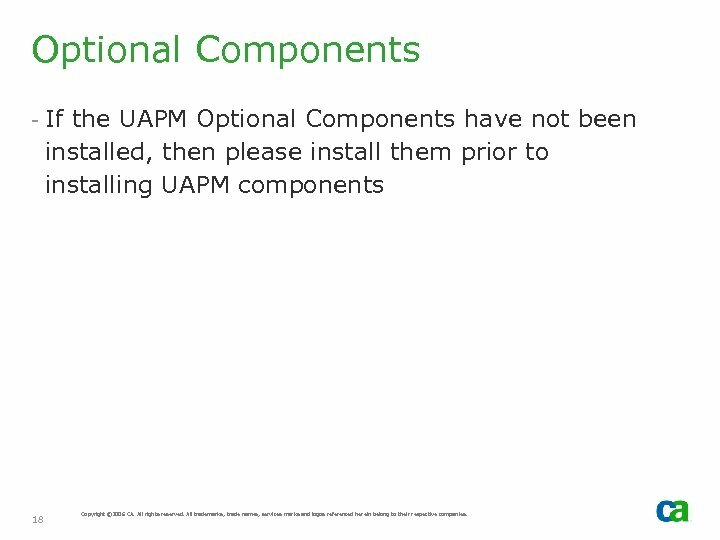 Install UAPM Optional Components on Node. A 2. Repeat UAPM Optional Components install on Node. B - For steps 1 and 2 consult part 1 of this presentation series 3. 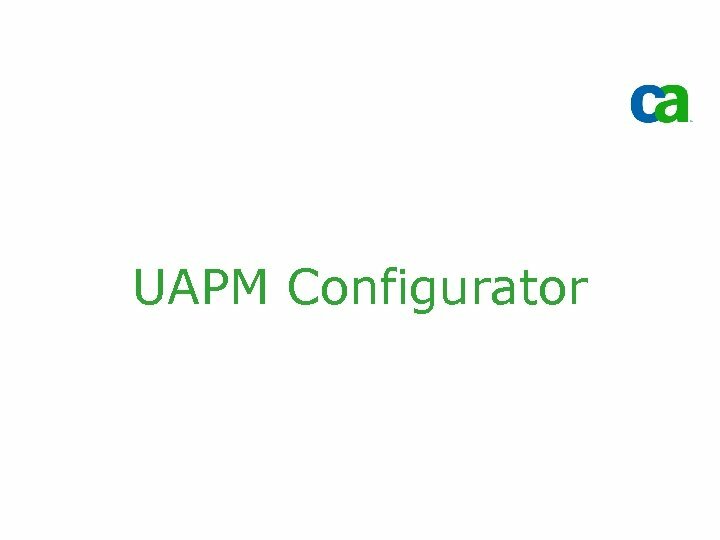 Install UAPM Manager components and utilities on Node. A 4. 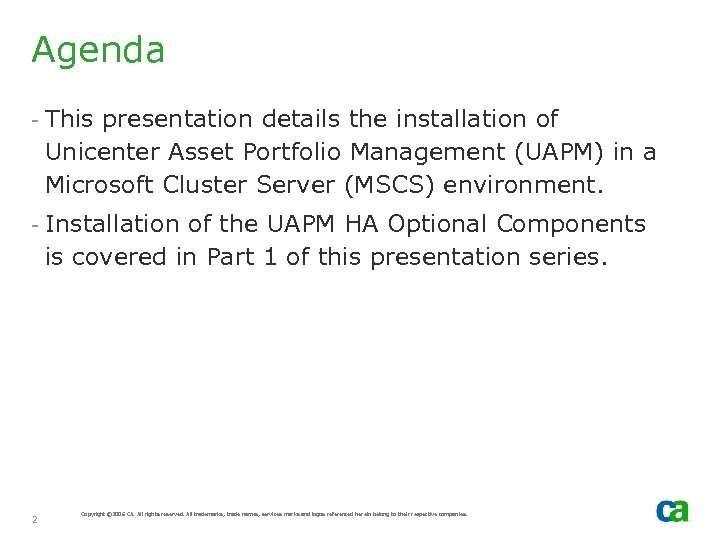 Define UAPM Cluster Resources 5. Move Group 6. 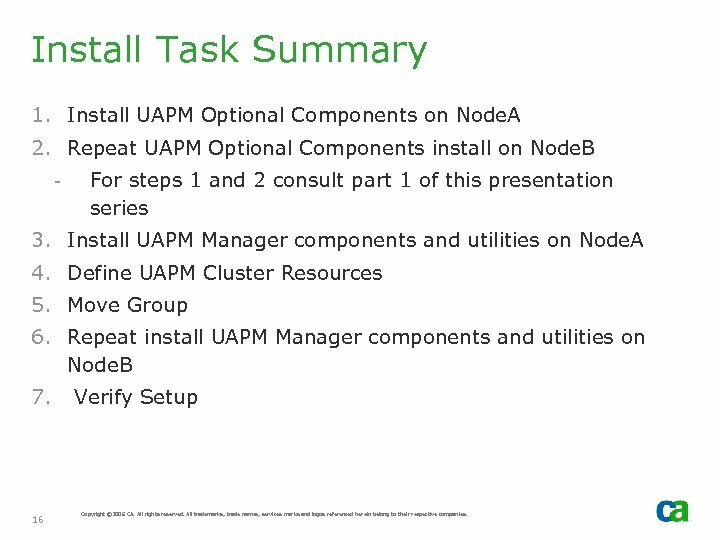 Repeat install UAPM Manager components and utilities on Node. B 7. 16 Verify Setup Copyright © 2006 CA. All rights reserved. All trademarks, trade names, services marks and logos referenced herein belong to their respective companies. 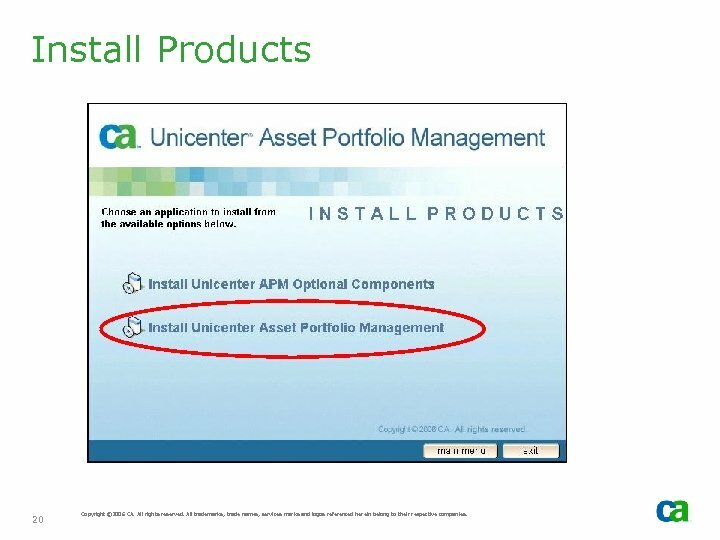 Optional Components - If the UAPM Optional Components have not been installed, then please install them prior to installing UAPM components 18 Copyright © 2006 CA. All rights reserved. All trademarks, trade names, services marks and logos referenced herein belong to their respective companies. Install 19 Copyright © 2006 CA. All rights reserved. All trademarks, trade names, services marks and logos referenced herein belong to their respective companies. Install Products 20 Copyright © 2006 CA. All rights reserved. All trademarks, trade names, services marks and logos referenced herein belong to their respective companies. 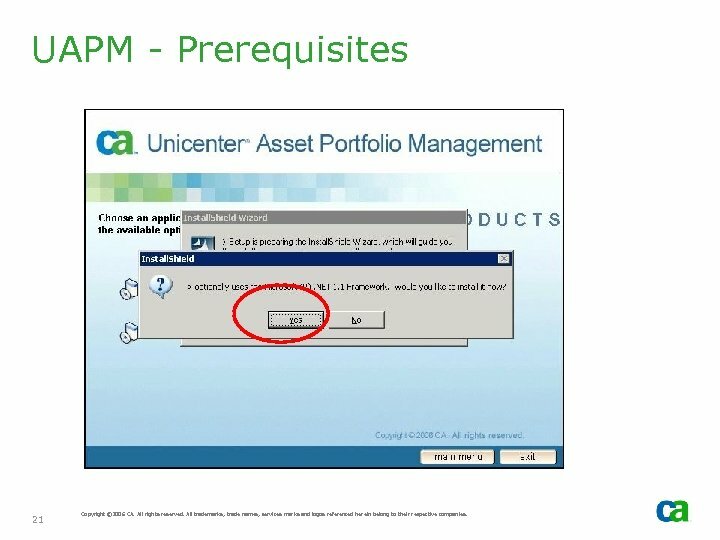 UAPM - Prerequisites 21 Copyright © 2006 CA. All rights reserved. All trademarks, trade names, services marks and logos referenced herein belong to their respective companies. UAPM - Prerequisites 22 Copyright © 2006 CA. All rights reserved. All trademarks, trade names, services marks and logos referenced herein belong to their respective companies. 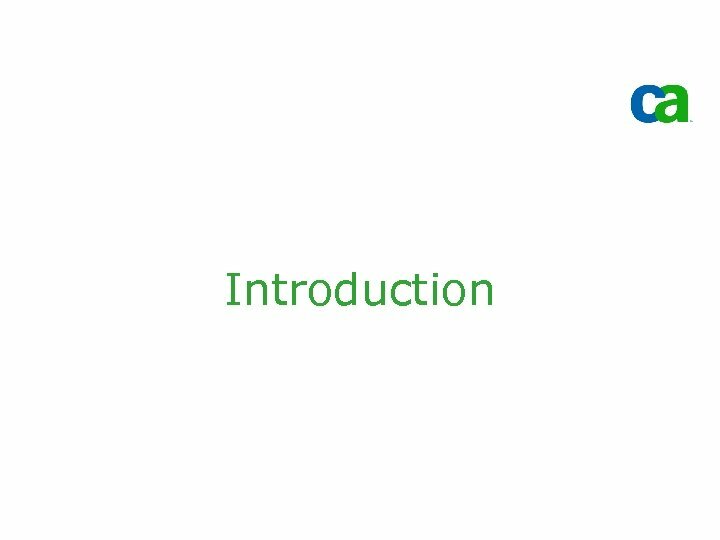 UAPM - Prerequisites 23 Copyright © 2006 CA. All rights reserved. All trademarks, trade names, services marks and logos referenced herein belong to their respective companies. Setup Type 24 Copyright © 2006 CA. All rights reserved. All trademarks, trade names, services marks and logos referenced herein belong to their respective companies. Components 25 Copyright © 2006 CA. All rights reserved. All trademarks, trade names, services marks and logos referenced herein belong to their respective companies. 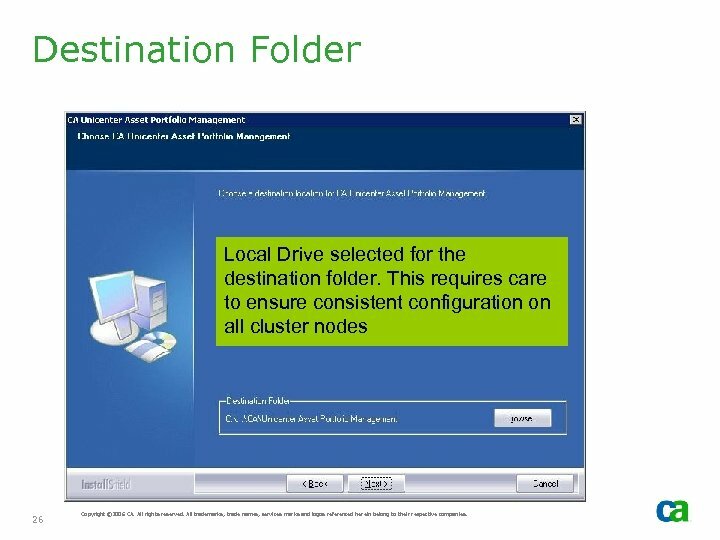 Destination Folder Local Drive selected for the destination folder. This requires care to ensure consistent configuration on all cluster nodes 26 Copyright © 2006 CA. All rights reserved. All trademarks, trade names, services marks and logos referenced herein belong to their respective companies. 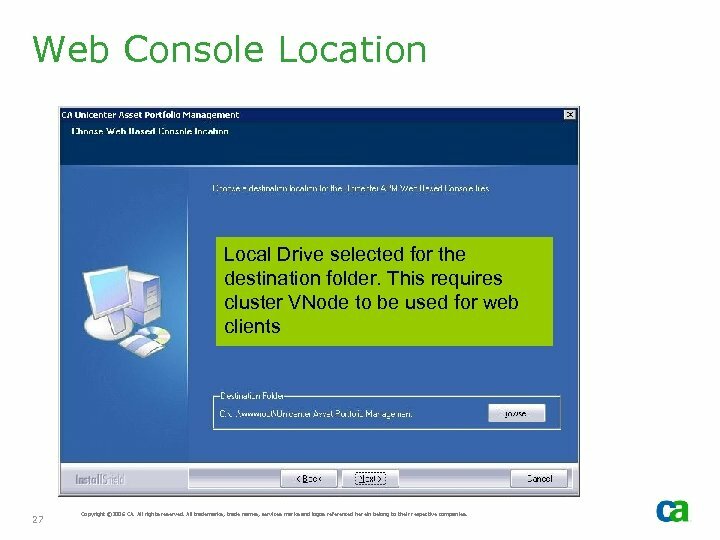 Web Console Location Local Drive selected for the destination folder. This requires cluster VNode to be used for web clients 27 Copyright © 2006 CA. All rights reserved. All trademarks, trade names, services marks and logos referenced herein belong to their respective companies. 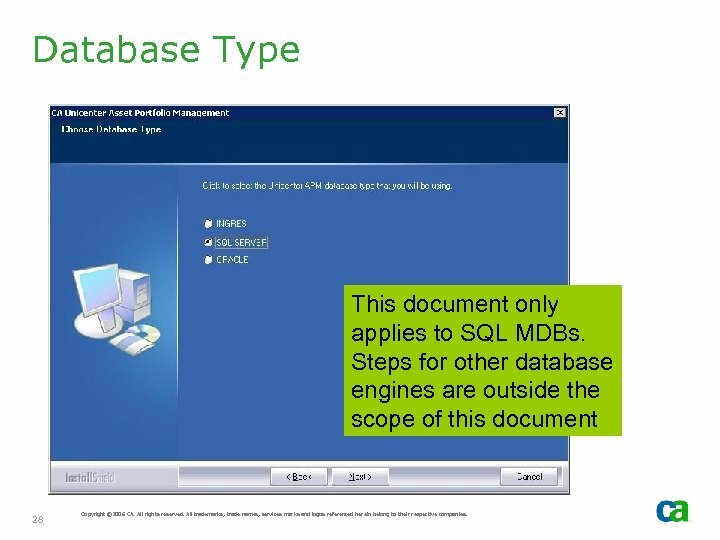 Database Type This document only applies to SQL MDBs. Steps for other database engines are outside the scope of this document 28 Copyright © 2006 CA. All rights reserved. All trademarks, trade names, services marks and logos referenced herein belong to their respective companies. 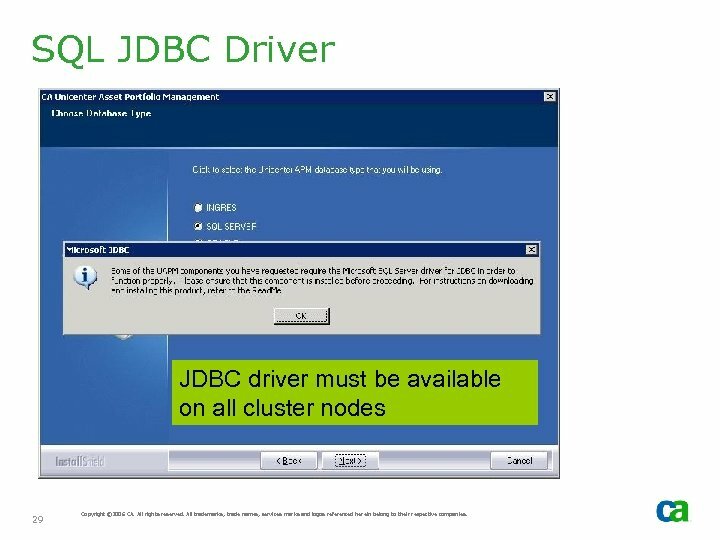 SQL JDBC Driver JDBC driver must be available on all cluster nodes 29 Copyright © 2006 CA. All rights reserved. All trademarks, trade names, services marks and logos referenced herein belong to their respective companies. 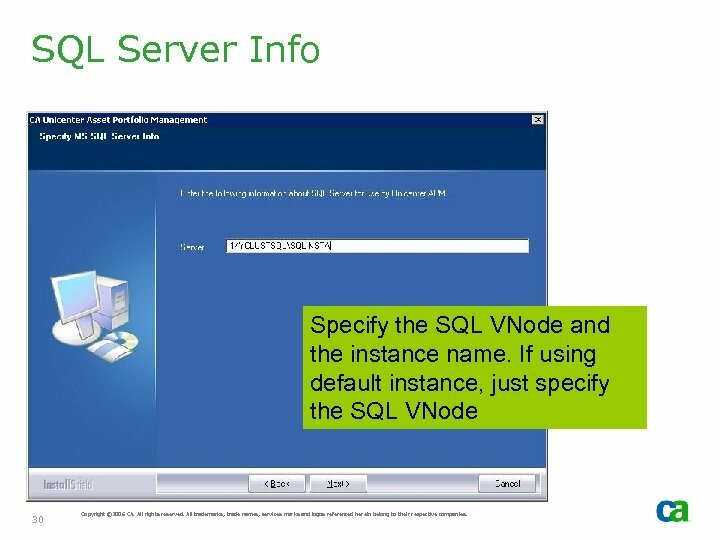 SQL Server Info Specify the SQL VNode and the instance name. If using default instance, just specify the SQL VNode 30 Copyright © 2006 CA. All rights reserved. All trademarks, trade names, services marks and logos referenced herein belong to their respective companies. 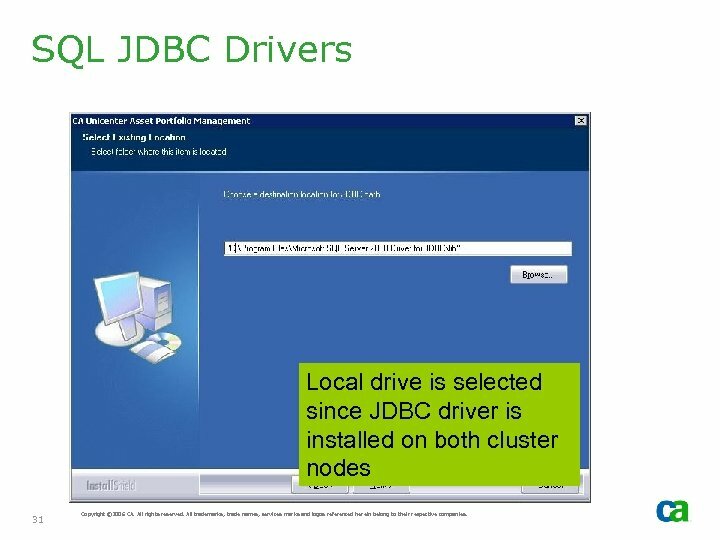 SQL JDBC Drivers Local drive is selected since JDBC driver is installed on both cluster nodes 31 Copyright © 2006 CA. All rights reserved. All trademarks, trade names, services marks and logos referenced herein belong to their respective companies. 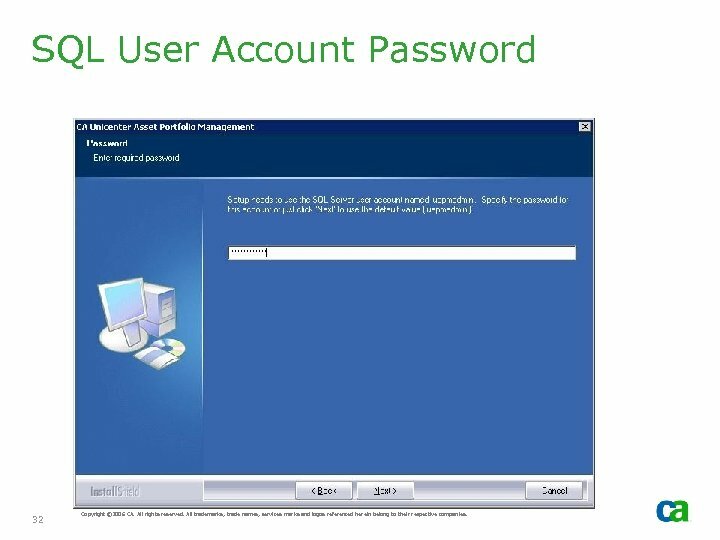 SQL User Account Password 32 Copyright © 2006 CA. All rights reserved. All trademarks, trade names, services marks and logos referenced herein belong to their respective companies. Install Summary 33 Copyright © 2006 CA. All rights reserved. All trademarks, trade names, services marks and logos referenced herein belong to their respective companies. Install 34 Copyright © 2006 CA. All rights reserved. All trademarks, trade names, services marks and logos referenced herein belong to their respective companies. 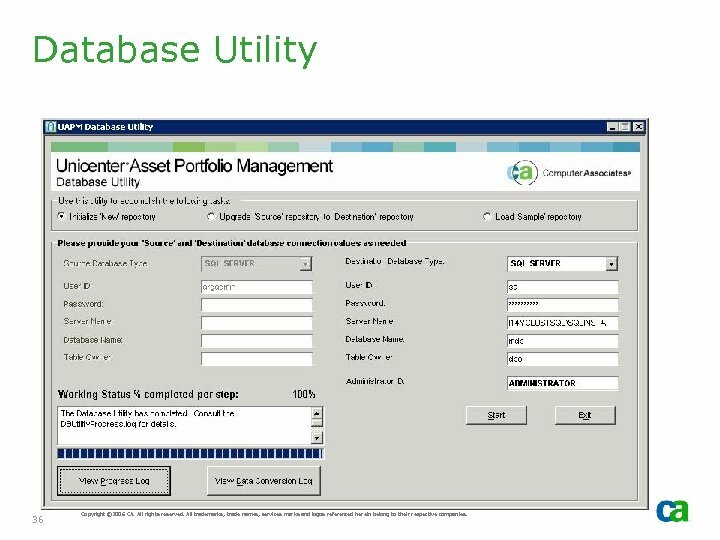 Database Utility 35 Copyright © 2006 CA. All rights reserved. All trademarks, trade names, services marks and logos referenced herein belong to their respective companies. 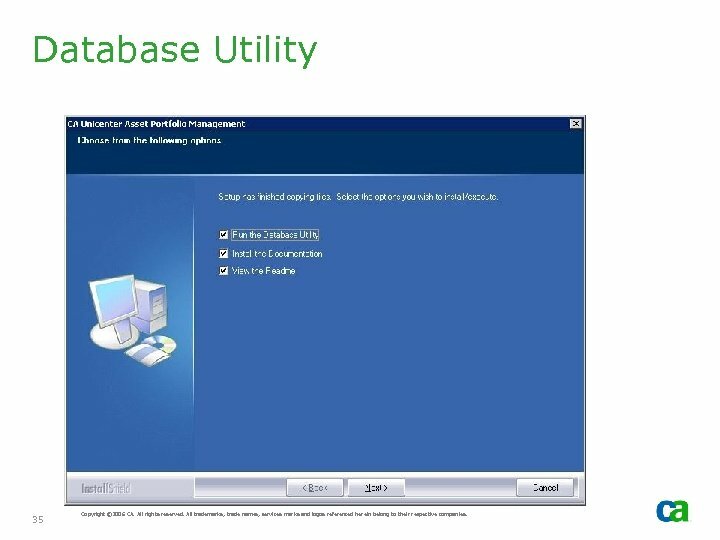 Database Utility 36 Copyright © 2006 CA. All rights reserved. All trademarks, trade names, services marks and logos referenced herein belong to their respective companies. Reboot Prior to reboot, define cluster resources 37 Copyright © 2006 CA. All rights reserved. All trademarks, trade names, services marks and logos referenced herein belong to their respective companies. 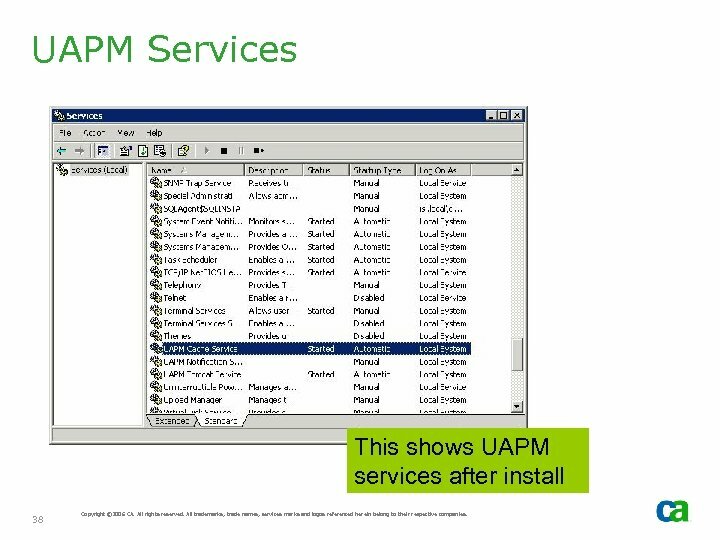 UAPM Services This shows UAPM services after install 38 Copyright © 2006 CA. All rights reserved. All trademarks, trade names, services marks and logos referenced herein belong to their respective companies. 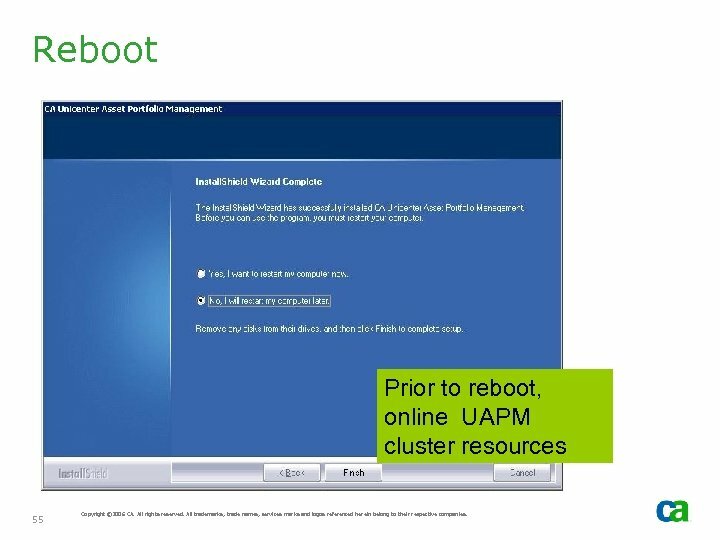 Define Cluster Resources - Install UAPM Cluster Resource Kit (u. APMCluster. 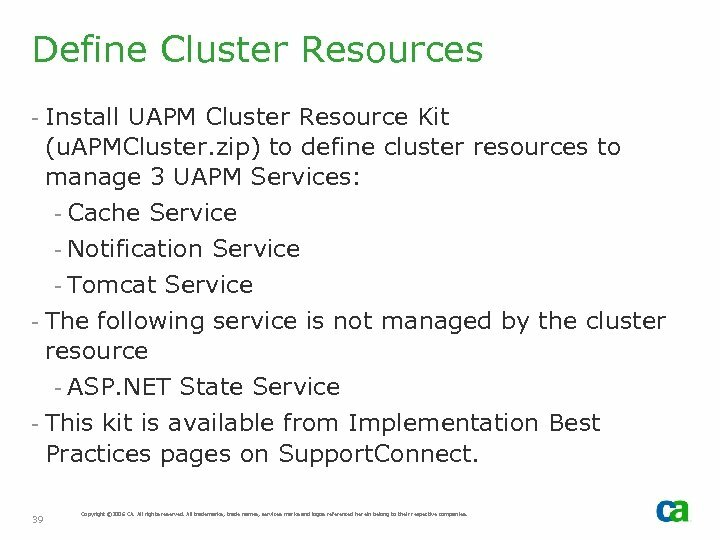 zip) to define cluster resources to manage 3 UAPM Services: - Cache Service - Notification Service - Tomcat Service - The following service is not managed by the cluster resource - ASP. NET State Service - This kit is available from Implementation Best Practices pages on Support. Connect. 39 Copyright © 2006 CA. All rights reserved. All trademarks, trade names, services marks and logos referenced herein belong to their respective companies. 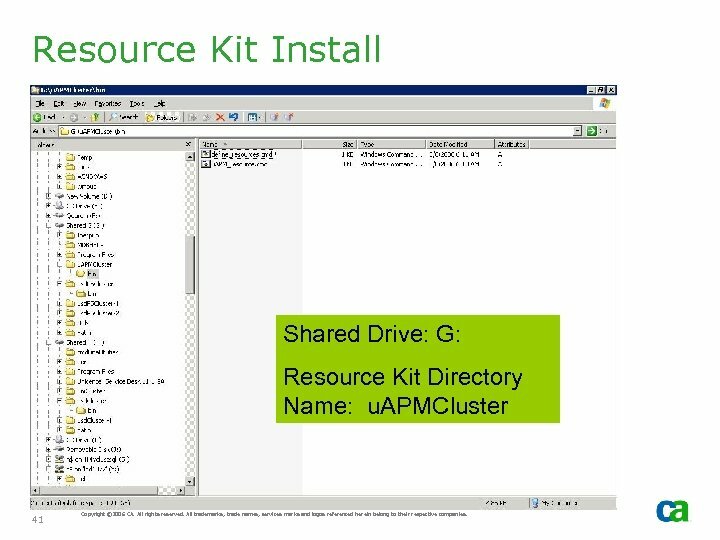 u. APMCluster Resource Kit - Extract u. APMCluster. 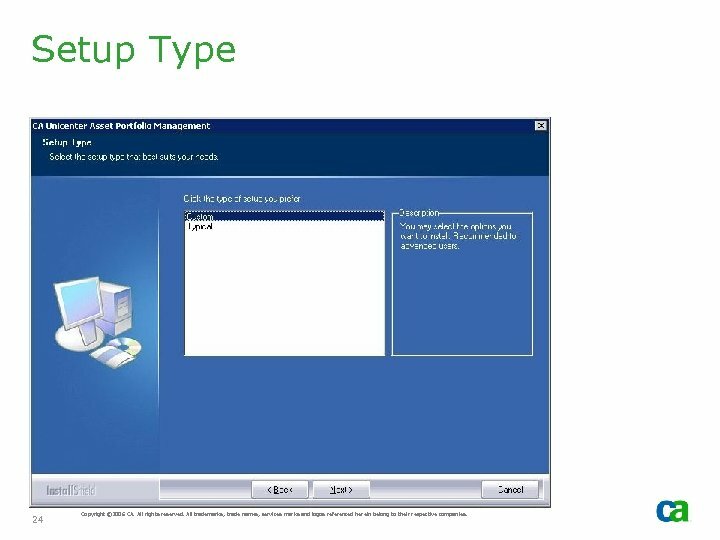 zip resource kit to a shared disk. 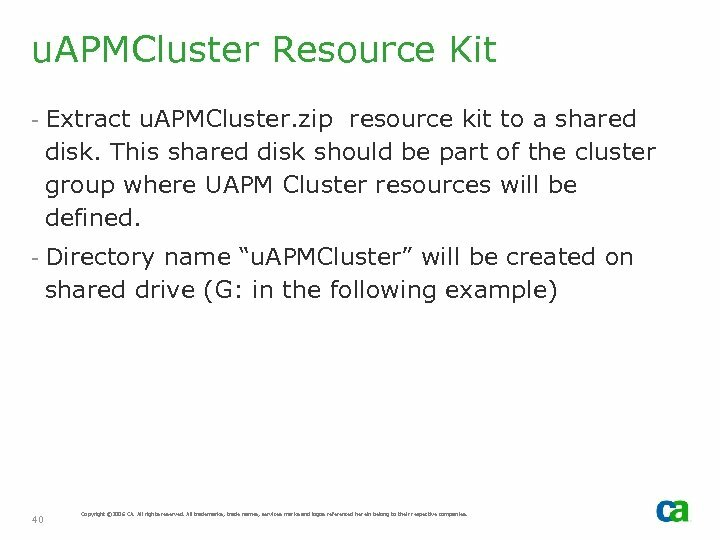 This shared disk should be part of the cluster group where UAPM Cluster resources will be defined. - Directory name “u. APMCluster” will be created on shared drive (G: in the following example) 40 Copyright © 2006 CA. All rights reserved. All trademarks, trade names, services marks and logos referenced herein belong to their respective companies. 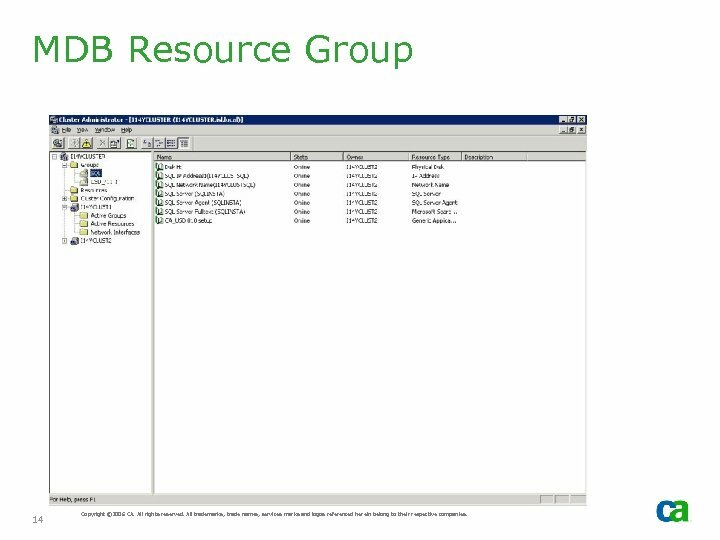 Resource Kit Install Shared Drive: G: Resource Kit Directory Name: u. APMCluster 41 Copyright © 2006 CA. All rights reserved. All trademarks, trade names, services marks and logos referenced herein belong to their respective companies. 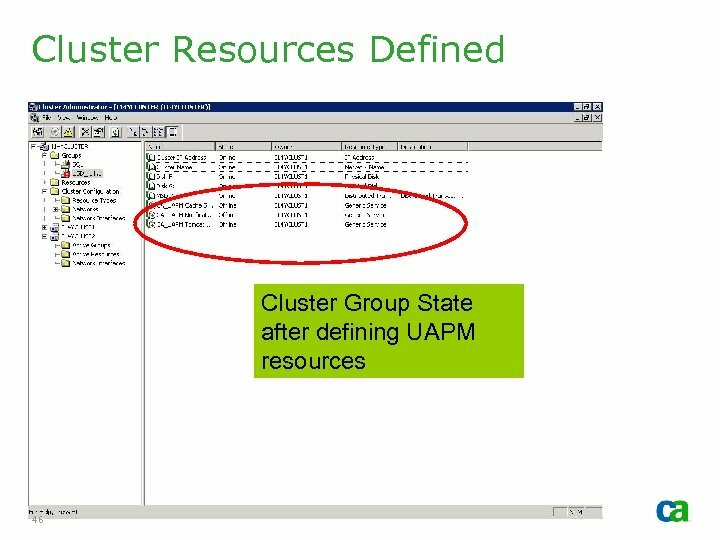 Define Cluster Resource - Modify uapm. Clusterbindefine_Resource. cmd - Example for this Install - Cd G: uapm. 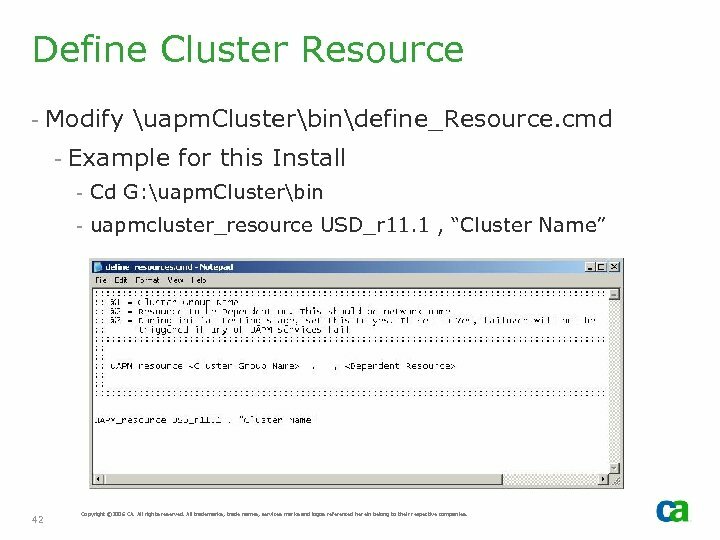 Clusterbin - uapmcluster_resource USD_r 11. 1 , “Cluster Name” 42 Copyright © 2006 CA. All rights reserved. All trademarks, trade names, services marks and logos referenced herein belong to their respective companies. 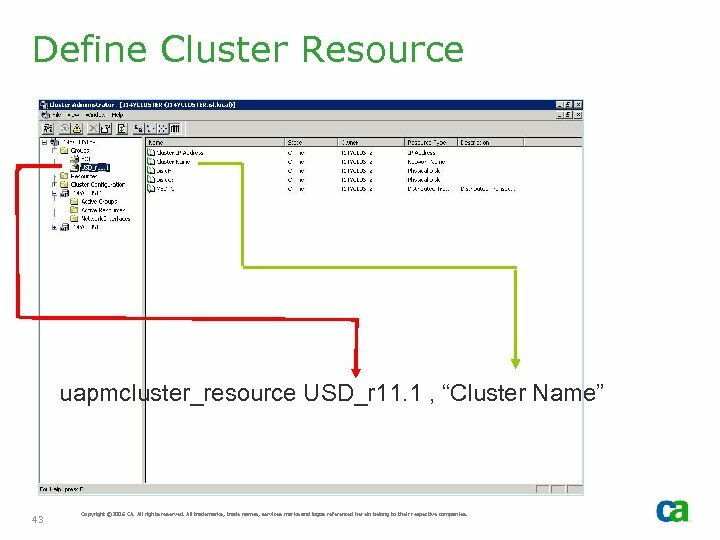 Define Cluster Resource uapmcluster_resource USD_r 11. 1 , “Cluster Name” 43 Copyright © 2006 CA. All rights reserved. All trademarks, trade names, services marks and logos referenced herein belong to their respective companies. Cluster Group State prior to defining UAPM resources 44 Copyright © 2006 CA. All rights reserved. All trademarks, trade names, services marks and logos referenced herein belong to their respective companies. 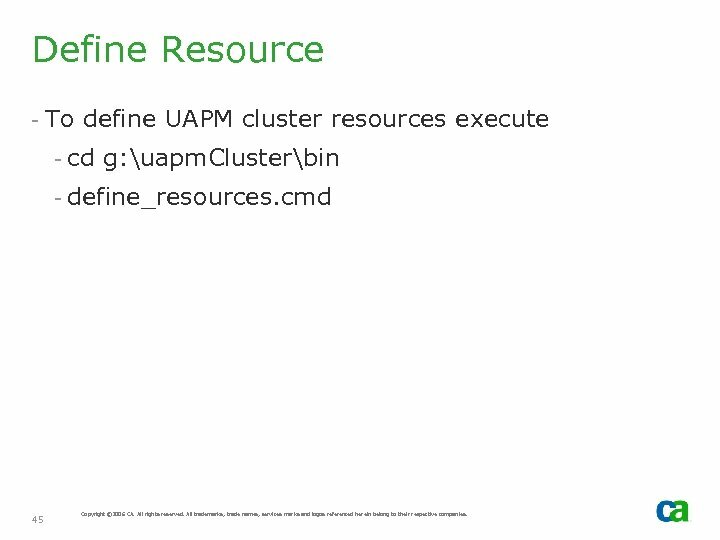 Define Resource - To define UAPM cluster resources execute - cd g: uapm. Clusterbin - define_resources. cmd 45 Copyright © 2006 CA. All rights reserved. All trademarks, trade names, services marks and logos referenced herein belong to their respective companies. Cluster Resources Defined Cluster Group State after defining UAPM resources 46 Copyright © 2006 CA. All rights reserved. All trademarks, trade names, services marks and logos referenced herein belong to their respective companies. Online / Offline - Online the 3 cluster resources defined. 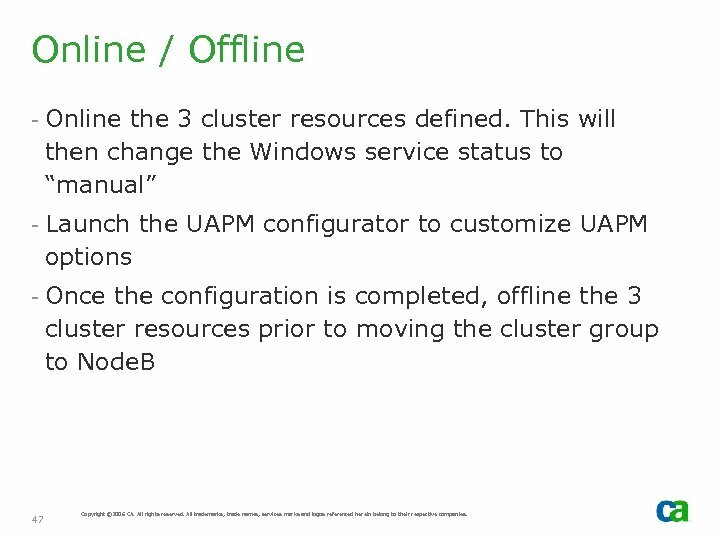 This will then change the Windows service status to “manual” - Launch the UAPM configurator to customize UAPM options - Once the configuration is completed, offline the 3 cluster resources prior to moving the cluster group to Node. B 47 Copyright © 2006 CA. All rights reserved. All trademarks, trade names, services marks and logos referenced herein belong to their respective companies. Configuration 49 Copyright © 2006 CA. All rights reserved. All trademarks, trade names, services marks and logos referenced herein belong to their respective companies. APM Configuration 50 Copyright © 2006 CA. All rights reserved. All trademarks, trade names, services marks and logos referenced herein belong to their respective companies. Configurations - There should not be any special considerations for other components 51 Copyright © 2006 CA. All rights reserved. All trademarks, trade names, services marks and logos referenced herein belong to their respective companies. Node. 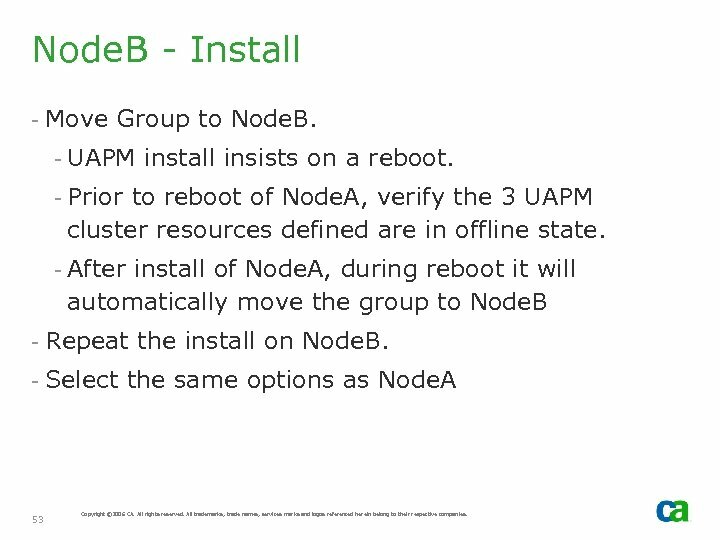 B - Install - Move Group to Node. B. - UAPM install insists on a reboot. - Prior to reboot of Node. 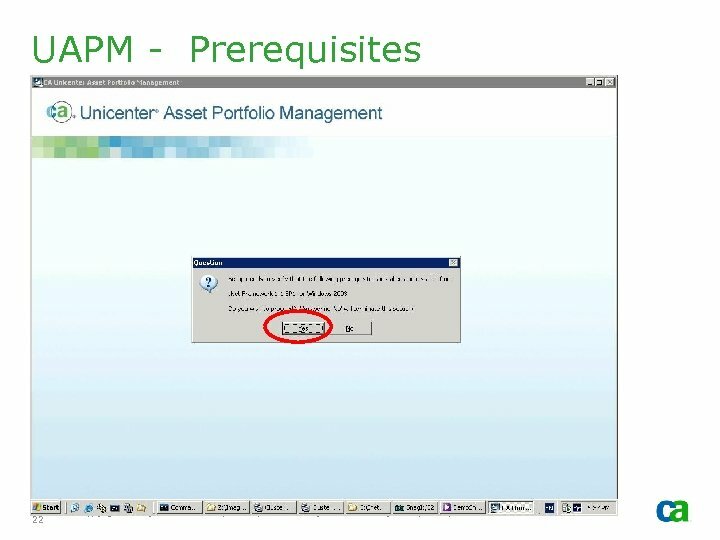 A, verify the 3 UAPM cluster resources defined are in offline state. - After install of Node. A, during reboot it will automatically move the group to Node. B - Repeat the install on Node. B. - Select the same options as Node. A 53 Copyright © 2006 CA. All rights reserved. All trademarks, trade names, services marks and logos referenced herein belong to their respective companies. 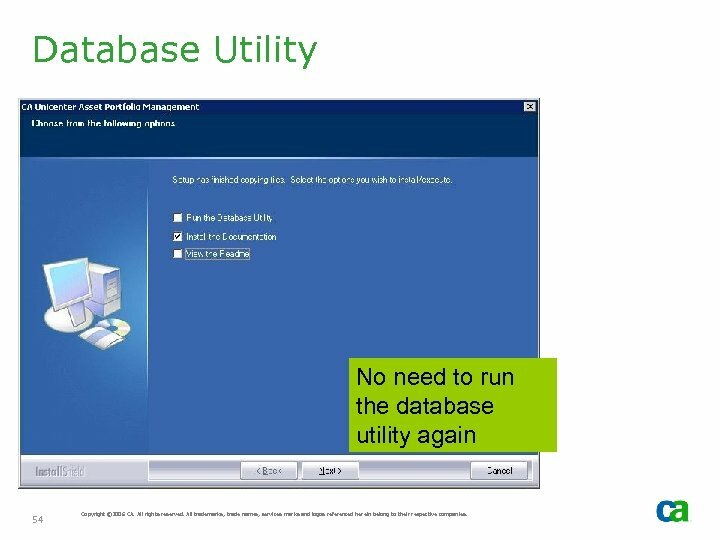 Database Utility No need to run the database utility again 54 Copyright © 2006 CA. All rights reserved. All trademarks, trade names, services marks and logos referenced herein belong to their respective companies. Reboot Prior to reboot, online UAPM cluster resources 55 Copyright © 2006 CA. All rights reserved. All trademarks, trade names, services marks and logos referenced herein belong to their respective companies. 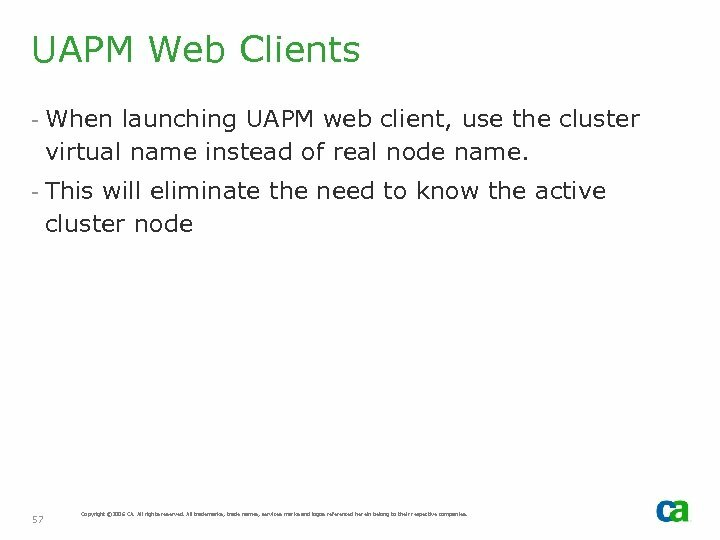 UAPM Web Clients - When launching UAPM web client, use the cluster virtual name instead of real node name. - This will eliminate the need to know the active cluster node 57 Copyright © 2006 CA. All rights reserved. All trademarks, trade names, services marks and logos referenced herein belong to their respective companies. 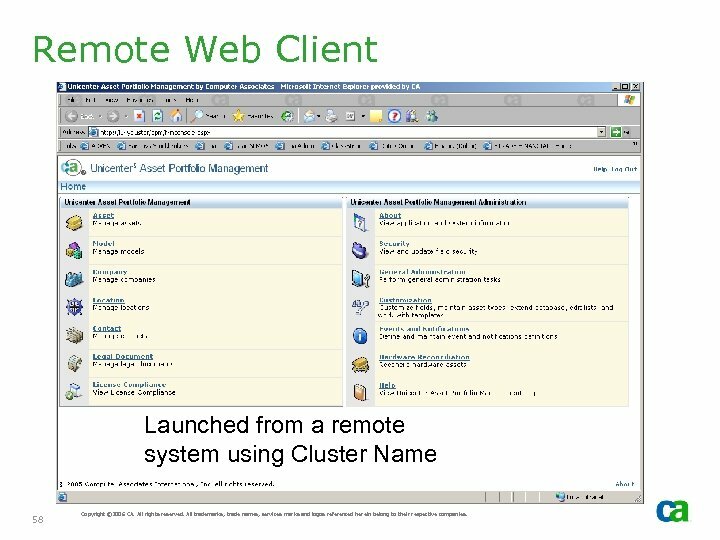 Remote Web Client Launched from a remote system using Cluster Name 58 Copyright © 2006 CA. All rights reserved. All trademarks, trade names, services marks and logos referenced herein belong to their respective companies. 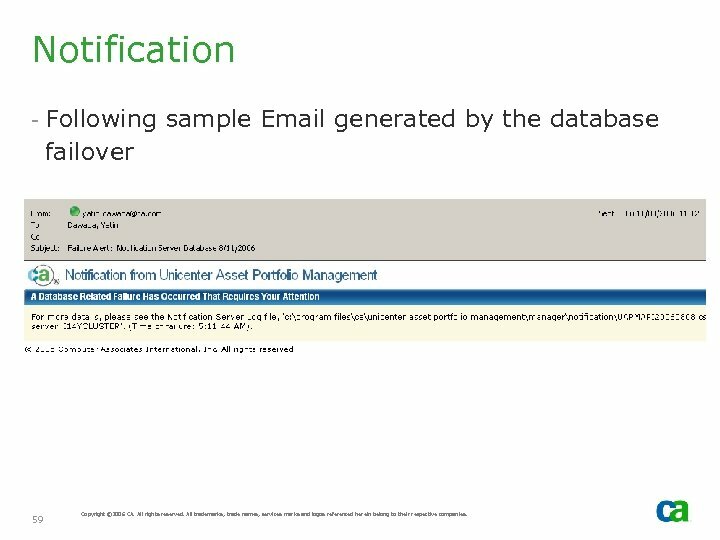 Notification - Following sample Email generated by the database failover 59 Copyright © 2006 CA. All rights reserved. All trademarks, trade names, services marks and logos referenced herein belong to their respective companies. 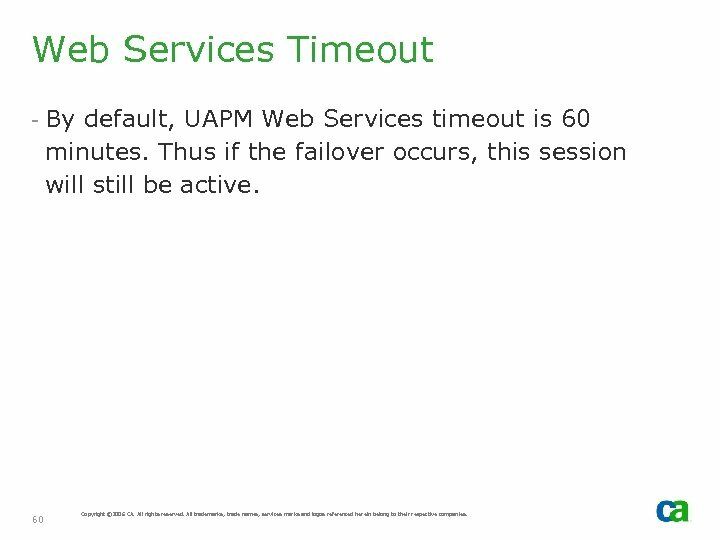 Web Services Timeout - By default, UAPM Web Services timeout is 60 minutes. Thus if the failover occurs, this session will still be active. 60 Copyright © 2006 CA. All rights reserved. All trademarks, trade names, services marks and logos referenced herein belong to their respective companies.